For multilingual families, travelling with children can be a fantastic way to expose them to different cultures and languages. Whether you travel to improve languages that your children already speak, or learn a new language so that you travel, both experiences can teach your children valuable life lessons. I would like to introduce you to Alice from Gus on the Go. 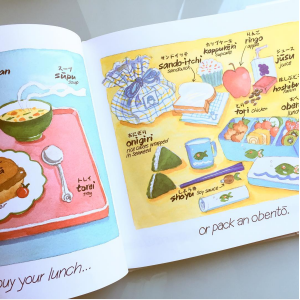 She recently took a trip with her multilingual family from their home in USA to Japan and Taiwan and is sharing her multilingual travel lesson. Before our children were born, my husband and I dreamed of raising multilingual children, nourishing their love for languages and laying down the groundwork for them to become future global citizens. My husband and I have Chinese Cantonese backgrounds, and live in the USA. But both of us spent short periods of time living abroad in different cultures.- my husband in Japan, and I in Korea. We agreed that our experiences in different countries broadened our horizons and greatly shaped our worldview. This was most definitely something we wanted to impart to our children, now 5 and 6 years old. 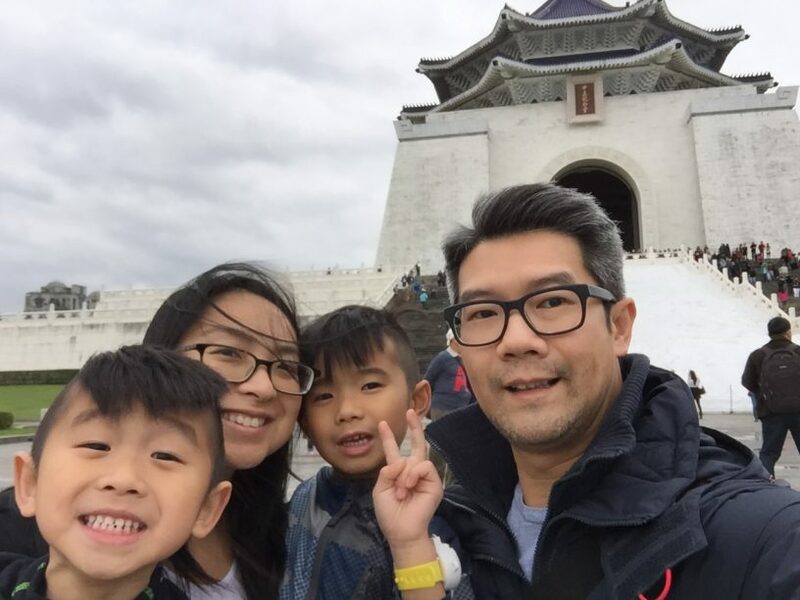 The first few years after our kids were born were spent focusing on teaching our kids Cantonese as their first language, which is also their heritage language. My husband and I have varying fluency levels. My husband’s Cantonese is much more fluent while mine remains a little above toddler-sized. We speak to each other in English but while the kids were younger, we spoke to them in Cantonese. (These days it’s closer to half English, half Cantonese). It wasn’t a perfect immersive environment- so we turned to travel for some language help. In those years, any travel we did was mainly to visit grandparents within the US. 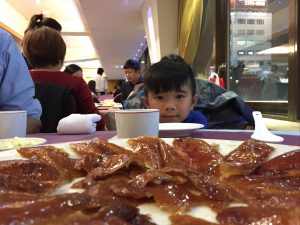 During those visits, we spent extensive time in the Cantonese community. It was the perfect way to marry high quality language learning time with precious family time. Our boys are now in preschool and kindergarten (English) and to some extent they are bilingual. Admittedly, they speak much more proficiently and expressively in English than in Cantonese. 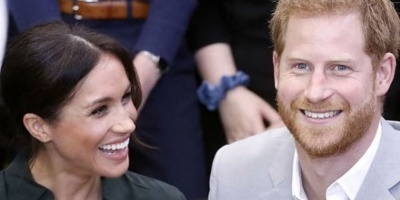 While we want to focus on supporting their heritage language, my husband and I also felt we were ready to pique their interest in other languages and cultures. With that in mind, this winter our little family of four embarked on our first overseas trip. We’re not from Taiwan, but my husband and I have been daydreaming of visiting Taiwan and eating through all their famous night markets for a long time. On a whim this past summer, I searched for tickets and stumbled upon flights that went through Tokyo. While many might frown at the thought of a layover, we purposefully booked the tickets with the longest layover so we also could give our kids a quick glimpse of Japan. I knew that we would be able to get around quite well, as my husband also speaks Mandarin and basic Japanese. But our children are not familiar with either language, so we decided to prepare for the trip by teaching our boys a few practical and polite phrases. We were sure to keep it light and fun. With only two overnight layovers planned for Tokyo, we taught them a few simple phrases in Japanese that we thought they could actually use during the time we were going to be there. 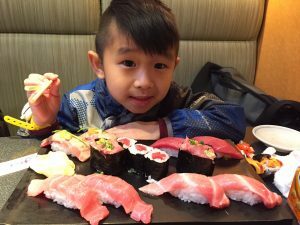 We first taught them “itadakimasu!” which loosely translates to “Let’s eat!”. It was a great phrase to start off with every time we ate Japanese food at home. We also taught them how to ask for things by using “onegaishimasu” as “please” and to ask “where is…?” by using “… doko desuka?”. As for our time in Taiwan, I knew we’d be interacting with people on a slightly deeper level since my husband speaks Mandarin fairly well. When we arrived in Japan the day after Christmas, I was really excited to watch my kids take in the sights and sounds of Tokyo. Their eyes lit up when they realized everyone around them spoke Japanese. The fact that they couldn’t understand anyone did not faze them in the slightest. 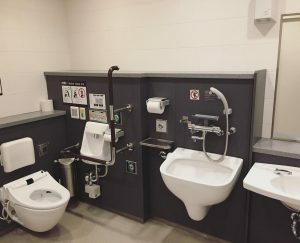 The first time we entered a family bathroom at Haneda Airport, my son exclaimed “Mommy, there’s so much detail in here!” If you’ve ever experienced a bathroom in Japan, you’d understand. There are signs, buttons and high tech bathroom fixtures galore. That evening we took them on a whirlwind eating tour and devoured ramen and yakitori. (Ramen is one of our favourite types of noodle soup and yakitori is grilled chicken on a skewer). In the morning, we took advantage of their East to West jetlag and woke them up bright and early to experience the chaotic Tsukiji fish market for a sushi breakfast. Their favorite food, of course, ended up being the simple onigiri (rice balls) that we picked up at various convenience stories. And just like that our layover in Tokyo was over, but we were more than ready to head to Taiwan! We spent the bulk of our trip in Taiwan, making stops in Taipei, Hualien, Kaohsiung and Taichung. My kids got to flex their Mandarin phrases always saying good morning (zao), hello (ni hao), thank you (xie xie) and goodbye (zai jian). Every other night we walked through different night markets discovering new favorites such as papaya milk (muguanai), Taiwanese fried chicken (dajipai) and Taiwanese sausage wrapped in a sticky rice bun (dachangbaoxiaochang). You can bet my kids held their noses and complained every time we passed by stinky tofu (choudoufu) stands! 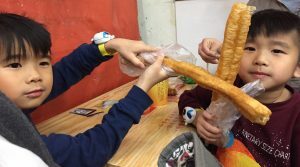 They also learned to really love soy bean milk (doujang) and fritters (youtiao) for breakfast. At our hotels, we watched Peppa Pig in Mandarin (known there as Pei Pei Zhu). And occasionally they even made a few friends at public parks. Language is never a barrier when kids want to play! 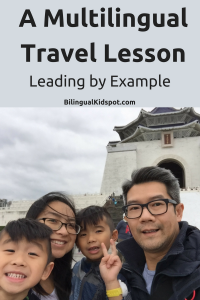 Beyond exposing the kids to various languages and cultures, I wanted our kids to see their parents use different languages in different countries. It’s one thing to tell them that learning multiple languages is useful, but it’s another for them to see these skills in action and experience it for themselves. 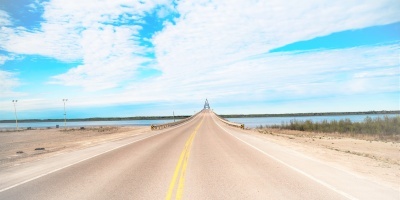 As our trip came to an end, I wondered if any of these experiences would remain with them. But all my uncertainty was erased when my oldest son proudly (and unprompted might I add) said Arigatou gozaimasu!/”Thank You!” to our flight attendants as we deplaned in the US. I was so surprised and touched, I had to hold back my tears. While our kids may not remember the many phrases we worked on, they have learned that although other cultures may look and sound different, they are worthy of respect, and their food is definitely worth trying! Do you teach your children the basic phrases of a language before travelling through new countries? Have you learned a new language so that you could travel somewhere? Or do you travel so that your kids can practice the languages they already speak. Let us know! Interested in reading more on Bilingual Parenting? Follow our Facebook Page for related articles on Bilingual Kids and Language Development. Subscribe to receive articles straight to your inbox, or join our private Bilingual parenting discussion group. What a wonderful way to engage children in language learning with a family travel! 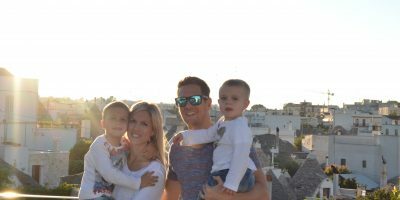 A well-planned family trip to the target language destination can really open the eyes for our children and connect the language with the culture. Great post!